Let there be color! I wanted a creative sketchbook & diary for my trip to Thailand, so here we go with more sketches! This isn't my first travel sketchbook post - go here for the very beginning of my Thailand travel & landscape sketches which I started in Inktober 2017. While Inktober usually focuses on, well, ink drawings, I fell down the rabbit hole of watercolor. It began with quick shadings and colorful accents on finished ink drawings. Then, I got REALLY unhappy with some of my color work and tossed the ink lines completely, to instead focus on just color mixing and values. There goes my Inktober. I love summers in Korea. They are incredibly hot and humid, but something about warm temperatures even at night and constant sunshine makes me feel all happy and cozy. Here are my favorite things to survive those hot days on Jeju Island and make them enjoyable. One quick tip for anyone trying to draw in a humid country: Beware of your paper absorbing air humidity or even the tiniest amount of sweat! I use a textile or at least tissue paper to cushion my hand while drawing, so my skin never touches the paper itself. I also use a plastic pouch to put my sketchbook into when going outdoors in humid weather. Once the paper absorbed some level of humidity, watercolors will get splotchy results. Who craves sweets in summer? Winters have me go for stews and savory soups, but as temperatures rise, I develop a sweet tooth. And since out kitchen gets unbearably hot (as in, 40 degrees celsius during the day...) baking something myself isn't an option. I've been gravitating towards all kinds of nut milks in ice cold smoothies, and baked treats from all those vegan bakeries that have popped up in both Seoul and on Jeju. I'm not sure if it's related to veganism or just plain old lactose intolerance, but there are a lot of new cafes and bakeries offering dairy-free cakes and breads. I even found brownies made with silk tofu instead of butter in a small, unassuming bakery on Jeju. Nut milks are on the rise, too, and I've been drowning in walnut milk, hempseed milk and pistachio milk, which couldn't be more delicious! I still plan on doing a longer blog post about intermittent fasting, but wanted to throw it into my summer favorites anyway. The mentioned SUPER HOT kitchen temperatures are one more reason to cook less in summer, and combined with automatically drinking more water during fasting periods, I just find the whole eating pattern of IF very suitable for summer. While I do crave more sweets in summer (ice cream, anyone?) I have less of an appetite when it's too hot overall, so this goes well with the one (or two) big meals a day pattern. I'm also still amazed at how much time intermittent fasting saves. Working from home can make frequent trips to the kitchen way too tempting... And even just cooking, preparing, and cleaning up after several meals a day always took up too much time and mental space for me. I found it so much easier to just get started with work in the morning and to tackle all those smaller, annoying tasks right away with only a (large) mug of coffee as my companion. I found my way back into Korean Dramas thanks to this! Oh, Forest of Secrets. My K-Drama obsession from this summer. Maybe it was the pitch-perfect tone and directing, or the tight and riveting plot that didn't rely on cheap thrills or "Makjang", or the nuanced acting from the whole cast, or just the timeliness of the subject (bribery, intrigue, political favoritism) after the clusterf! @# of recent events in South Korea, this drama shot to the very top of my all-time favorites list. We watched the last two episodes with friends and cold makgeolli under a starry summer night sky and the whole experience was cathargic. If you want to get a (relatively, it's still TV after all) realistic sense of life in Korea, of its business structures, and the bleakness one can feel when faced with large-scale corruption, while at the same time getting the suspense of a well-made crime thriller AND some truly lovely and hilarious characters and relationships, Forest of Secrets (or "Stranger" on Netflix) is the way to go! Forest of Secrets had a cold atmosphere to it, with its somber color palette and bleak setting, and I took that theme and ran with it for my reading choices. Books set in the north, in wintery landscapes or fantastic ice worlds are the perfect mental air-conditioning when it's blazingly hot outdoors! Some of my all-time favorites like the His Dark Materials trilogy or good ol' ASOIAF feature northern settings, and I've found a new book series that fits the same snowy bill. "The Bear and the Nightingale" is the first book in a new series based in Russian myths and fairytales. I didn't expect much (had the book in my Audible library for a while...) but the story had very interesting, nuanced characters, a lot of different and engaging POVs, a coming-of-age angle with all the time that went by, and it interweaves myth, religion, history and magic with a deft hand. I can't wait for the next part of the series! Every. Single. Summer. Innisfree's Jeju Volcanic Pore Clay Mask is my favorite exfoliating wash-off mask. I use it about once a month in winter, and weekly during summer. Even on my desert-dry and sensitive skin, this mask provides just the right amount of gentle exfoliation, removing gunk and dirt (TMI) while leaving my skin soft and moisturized. Innisfree came out with multiple versions over the years, and while some are more convenient (mousse based) or have additional effects (their new color clay masks with purposes like brightening and calming) I always come back to the Super Volcanic Clay Mask in the end. One is simple: FROZEN blueberries. I never get the fresh ones but buy large frozen bags to stuff into my freezer. A handful of ice-cold blueberries are the perfect topping for muesli, oatmeal, smoothies or.... I just eat them. Like tiny fake icecream balls. While I love cacao nibs, my first bite of actual freshly roasted cacao beans was a whole new world of taste! I might have a bit of an obsessive problem with these by now. That's it for my summer favorites. Lots of food, cold fictional and not-so-fictional worlds, and fasting for more free time and less time spent cooking. How do you keep the summer heat from getting to you? Are you looking forward to fall? It's been nearly four years since I came to Jeju Island, and I'm still discovering new places on this ever-changing summer vacation destination. Let's discover hidden spots around Seogwipo and on Hallasan for a lazy, relaxing day trip. 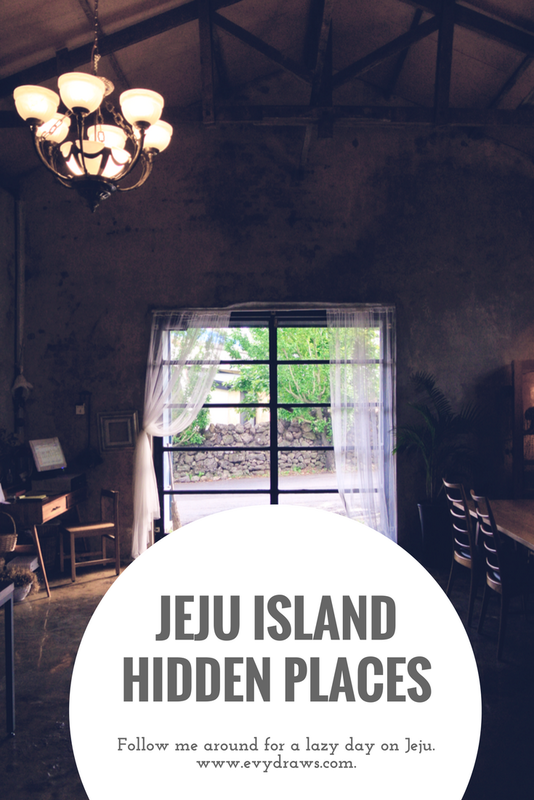 Follow me around Jeju Island, as I visit hidden places, cafes and generally stay far away from tourist attractions. On a warm day, as the mid-afternoon sun blazes on, hiding away in a cool and calm renovated barn building is the perfect way to recharge! This cafe has a nice balance between chic and cozy. In a bit of a fake-out, the destinations on Jeju Island featured here were all visited on the same day as the Bottle & Bowl restaurant. That review got way too long, so I decided to split it up - so here's what I do on a lazy day trip around Jeju Island, the coffee and nature edition! Jeju Island is famous for its beaches but there's a different charm to be found away from tourist attractions and crowded seaside restaurants. As you travel deeper into the countryside, leave behind the two larger cities on the island and deliver yourself into the hands of Naver Maps, an abundance of little cafes and mom-and-pop-style shops can be found. This cafe, called "Kiasma", is located just outside of Seogwipo city and best reached by car since there's a bit of an incline to overcome. As mentioned, the building was once a barn - lately, Jeju Island's traditional stone houses and the slightly larger barns have changed hands from farmers to small business owners. What, from the outside, often looks like nothing much, can turn out to be anything from a bakery to an art gallery - so keep your eyes open as you go along! While Jeju has its fair share of coffee shop chains, the smaller cafes sport unique decor - from handmade to designer furniture - and often have an eclectic mix of styles. Themed cafes were all the rage for a few years, so you can find flower-cafes, dog-cafes, wood-work cafes, photography-atelier-cafes, pottery-cafes... really, pretty much everything. Most cafes then specialize on a few select menu items. Kiasma doesn't only serve coffee but has an extensive menu card for lunch/brunch, which is available until 3 PM. Since we arrived perfectly full after a day of smoothie bowls and rice cakes, coffee it was. "Americano" coffee can be found in every single cafe in Korea. Before my first visit to Korea, I didn't even know what an Americano was - depending on the cafe, these can turn out incredibly watery and weak, though. As a vegan, I order them from time to time since they're often the only hot coffee option open to me. Kiasma's Americano is actually really good, if a tad sweet (even though there wasn't any sugar in it yet - it just missed a bit of depth and acidity). It did go well with the espresso we had, though! Good espresso is hard to find! Most Koreans prefer their coffees large, sweet and milky so espresso isn't always on the menu. The entrance of Kiasma - it's easy to miss as you drive by since all the buildings nearby spot a similar look. Just keep your eyes open for the hardly readable "Kiasma" sign. Time to move! You can't just sit in cafes all day (right? ...sure? ), so taking a walk instead of going hiking was a nice way to fit the outdoors into an otherwise lazy day. Hallasan at the center of Jeju Island is more fit for entire days of hiking and picnics, but there are some shorter trails in the lower regions of the volcano. 1100고지 습지 is a wetland region (or, it would be wet if it had rained in recent memory...) at 1100 meters above sea level. What's better on a lazy day than completely level ground and a trail that doesn't require any hiking-appropriate shoes? While you can use the wetlands as a starting point for longer hikes around the mid-level regions of Hallasan, we just went for a short walk - barely enough time to finish the drinks we'd brought along. Temperatures were still mild up on the mountain, and I generally recommend bringing a cardigan with you even in summer when you travel to Jeju Island. All the cafes, restaurants and museums are air-conditioned to resemble the ice age... which has me catch colds more often in summer than winter. I've been pretty much wearing nothing but flowy midi skirts this spring... so comfy and simple, even if they make me look pregnant. That's it for my lazy afternoon trip on Jeju Island. If you plan on visiting Seogwipo city, definitely check out the cafes and Bottle & Bowl! If you're on Jeju Island only for a couple of days but still want to go into nature, I'd recommend the mid-region of Hallasan or one of the countless little "Oreum" volcanic hills for short walks and hikes that don't require fancy gear or lots of time. Or leg muscle work. Have you ever tracked your time? The practice of noting down exactly when you did what, and for how long, during any given day, can give valuable insight into your own habits. It shows where, often unexpectedly, a lot of time is 'lost'. While I hate the expression of 'wasted time' (personal care, or just spacing out, can be just as or even more valuable as constantly running about), as a self-employed artist working from home, it's very important for me to know my own productivity pitfalls and habits. Knowing how much time I usually need to actually complete any given task, from the very first sketches to the very last layout adjustments, helps in determining my monthly schedule, the commissions I accept and my freelancing rates. I use a cheap plain notebook (the flower pattern one) to do my daily sketches. But since just plain tracking got boring after a while (I did that a lot in the beginning of my freelancing career) I recently switched to doing occasional diary drawings that summarize my entire day. This is a great way to reflect upon a day, looking at what I actually got done and what I'm thankful for. I also use these diary drawings as a helpful way to track my meals. When I'm busy, I often forget to eat or just live on cereal, so actually having to draw that down keeps me accountable. Freelance illustration work is quite unpredictable. Tasks change depending on clients, if they need layout/digital work or actual watercolor illustrations; if I have time to focus on my own projects and Etsy store; if I have to help out at the cafe a lot (mostly shifts on late afternoons/evenings) or pressing deadlines to throw everything upside-down. Batching | Organizing my daily routine in themed portions. How does 'Time Batching' or 'Task Batching' work? To use 'Batching' (or 'Block Scheduling') in a daily routine and schedule, similar tasks are grouped together. This can mean tasks that require similar materials or similar mindsets. Once (especially small!) tasks are part of a group, it's easier from one to the next since all necessary materials or references, or the necessary peace of mind, are already in place. It also makes it easier to schedule out individual days, especially for self-employment or when working from home. Instead of being overwhelmed by the flurry of small to big tasks that need to be scheduled, they simply fall into one of the established 'batches' and those batches have their fixed place in any given day (or week, though this blog post uses daily batching). Morning: Organisation, Client Contact, Etsy / Packaging, Social Media, Digital Work / Layout and design work. Anything requiring my laptop and internet, I get done before lunch. This helps me getting started - I'm way too restless in the morning to just start on one single, long task. Getting all the tiny to middling tasks done first thing lets me cross off a huge portion of my to-do list. The time difference from Korea to most of my clients (Europe, United States) also requires for me to reply to emails and messages first thing in the morning. Especially the storyboard company in the States I'm working for will just finish their day when I get up, so it's always a good idea to check in for any pressing matters. I also update my social media in the morning most day, and get housework done (meal-prep, cleaning, washing...). Lunch: Most of the time we eat something small at home. If I have orders to ship that day, I'll get my trip to the post office done before mid-day. This marks the end of my 'Organization' batch. Afternoon: Painting. No matter what kind of client I'm currently working for, there's always something that needs to get painted or drawn. While I'd focus on layout sketches, drafts and style tests in the morning, afternoons are reserved for just the craft itself. Thanks to doing all my organization work in the morning and having lunch as this 'official' shift in my day, I can completely switch off the part of my brain that's normally occupied with future projects, finances or the internet in general. Sometimes I'll need reference images for certain pictures, which I'll transfer onto my phone so that my laptop can remain closed. This really helps in staying focused! I also mostly ignore social media during the afternoon, and often just switch my phone's wifi off for emphasis. This is the time I listen to audiobooks! On rare occasions, I'll have too much digital work piled up (some of my storyboard commissions are 100% digitally drawn, for example) and I'll use the afternoon to paint in Photoshop, but apply the same rules of not going online and not focusing on anything but drawing, anyway. This is when I switch back to digital work, scan any finished paintings or sketches from that afternoon's work, adjust them in Photoshop and send out the result to commissioners. The cafe I help out at also is at its busiest in the evening, so I'll be jumping back and forth between service and short tasks like Etsy listings updates, mails, blog posts and editing. There's not any specific point when I 'get off work', but the cafe closes around 9 pm, so I take a break to eat dinner. After dinner, I mostly focus on digital paintings that need more concentration (harder to do when you're interrupted during the earlier hours) and sketching for my own projects. Late evening is also a good time to post on my blog or social media, or add new Etsy listings. If I feel tired, I'll just work on some easier drawings while watching my favorite TV shows. On most days, I go to sleep after 1 am or 2 am. Whenever I manage to change my rhythm into something healthier, you can be sure that a pressing deadline in a different time zone will keep me up until 4 am and mess up everything anyway. My eating habits are really terrible, though, now that I look at the sketches. When I have time, I love cooking and also tend to eat HUGE portions... only to then forget eating when I'm busy. Hopefully, I'll find some sort of balance there! I hope to continue with diary drawings like these! Even just scanning them now, a month later, these are a nice way to look back at small things like delicious meals and drawing projects. Do you work from home? How do you build your daily routines?